Children are seen as large flourishing consumer market. The purpose of the study is to review the available literature and assess how children act as consumers. Focusing on the food choices made by the children this study reveals the developmental sequence characterizing the growth of consumer knowledge, skills, and values as children mature throughout childhood and adolescence. Children place higher level of trust in interpersonal information sources, especially in their parents who are perceived as the most credible information source with respect to their learning about new food products. The food choices made by children seemed to involve cognitive self-regulation where conflicting values for food choices were integrated and brought into alignment with desired consequences. Children's perceptions of the value of their parents' efforts to use television advertisements make a positive contribution to their consumer socialisation. Based on the evidence reviewed, implications are drawn for future research in the field of children's consumer behavior. Children, Consumer Behavior, Food choice, Consumer socialization. The market of food and eating items is increasing day by day. The food marketers are targeting children and adolescents as customers with intention to affect their food choice, food preference and ultimately food buying behaviour. Market research shows that children wield considerable power as consumers, and their influence on family purchases goes beyond the selection of toys and cereals. Children also exert a substantial influence on their parents' consumer decision making and spending (Hawkins et al., 2001). Blackwell et al. (2001) states that adolescent influence on household spending varies by product user and by degree. They have a greater influence in decisions on purchases of products for their own use. Though there have been many scholarly researches on consumer behaviour of children there is lack of systematic research on the consumer behaviour of children, and specifically the influence or role of consumer socialisation agents (such as parents, peers, retailers and school), can possibly be ascribed to the fact that marketers may think that it is inappropriate to regard children as a "market" (McNeal, 1973). The effects of advertising (and the role of the mass media as a socialisation agent) on children have, however, been the subject of considerable research during the past three decades (Meyer, 1987; Roedder, 1981; Macklin, 1987; Yavas & Abdul-Gader, 1993; Cardwell- Gardner & Bennett, 1999). The findings of a recent study by Carlson et al. (2001) indicate that parental styles plays vital role in determining the manner in which mothers socialise their children about television and television advertising. Children are difficult to study, and today's children live in a rapidly changing technological world. Research must therefore be undertaken to understand the consumer behaviour of children, and to ascertain the reasons why they feel and act the way they do. In the Indian context, a limited number of studies have so far investigated the consumer behaviour of children. In order to assess the consumer behaviour of children it is very important to analyse the consumer socialisation process. A broad overview will be provided of the nature and processes of consumer socialisation and the research conducted in this field during the past few decades. A number of important marketing implications with respect to children's buying behaviour are discussed. To review the impact of promotional activities on the food buying behaviour of children. The process of consumer socialisation of children moves through various cognitive and social phases on their journey from birth to adolescence and adulthood. Consumer socialisation (which is only a part of a child's general socialisation) is described as "the processes by which young people acquire skills, knowledge, and attitudes relevant to their functioning as consumers in the marketplace" (Ward, 1974). Although McNeal (1993) sometimes refers to it as "consumer education" or "consumer development", Ward's description of the concept can be regarded as a universally accepted definition (McGregor, 1999; John, 1999; Carlson & Grossbart, 1994). John (1999) views consumer socialisation as a process that occurs in the context of social and cognitive development as children move through three stages of consumer socialisation, namely the perceptual stage (3-7 years), the analytical stage (7-11 years), and the reflective stage (11-16 years). This latter stage, which is particularly relevant for this study, is characterised by the development of information processing skills (such as interpreting advertising messages) and social skills. 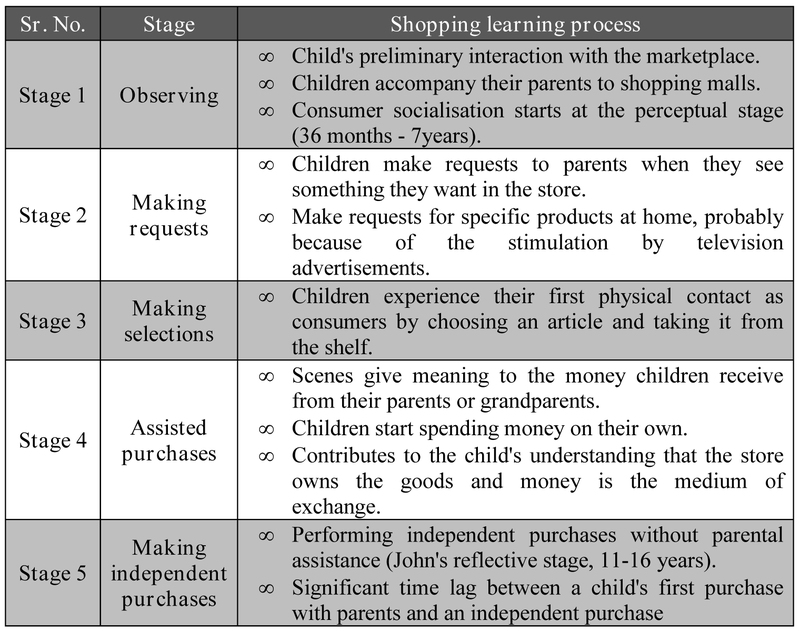 Table-1 : Children's five-stage shopping learning process in their consumer development (McNeal & Yeh, 1993). In a study Acuff (1997) reports that teenagers do not consult their parents for buying candy and soft drinks in most instances. The theory and published literature focus largely on consumer socialisation in the childhood phase. McGregor (1999) and Engel et al. (1995) emphasise, however, that it should be recognised as a lifelong process. Recent studies by consumer scientists observed other areas of consumer socialisation, such as the socialisation of consumers in a global marketplace, and the protection of consumers in the electronic marketplace (McGregor, 1999); consumer complaint behaviour in the children's wear market (Norum & Scrogin, 1996); and the factors that influence the food choices of children between the ages of 9 and 17 years (Hamilton et al, 2000). No attention was given to the role of the media and parents as socialisation agents in these latter studies. McNeal (1973) reviews the value of and the reason for the need to study the consumer socialisation of children as follows: "Much consumer behaviour is performed under the influence of others. The very foundation of human behaviour is learning from others." At the same time McGregor (1999) states that consumer socialisation is a function of, inter alia, the age of the child, the content that is learned, and agents of socialisation in the market. The studies on consumer socialization have got enough importance since the era of world War II. In early stage pioneers like Guest, McNeal, Berey and Pollay (John, 1999) began to examine factors related to the consumer behaviour of children. The topics investigated include children's understanding of marketing and retail functions, brand loyalty and the influence of children in family decision making. In the case of children again the studies are limited. Socialisation agents are the persons and organisations involved in the orientation and education of children as consumers. Some examples would be family members, peers, the mass media, schools and retailers (John, 1999). Research in the field of the consumer socialisation process of children gained momentum in the mid-1970s (John, 1999). Scott Ward's (1974) article entitled "Consumer socialisation" which was published in the Journal of Consumer Research, forcefully argued for studying children and their socialisation into the consumer role. This gave a lead to a new generation of researchers, and in particular directed their attention to the role of socialisation agents in children's development as consumers. Of particular importance to this review are the studies that focused on children's knowledge of consumer issues, and the influence of the family and the media (as socialisation agents) on children's development as consumers. The family can be regarded as the primary source (agent) of consumer socialisation. Extensive research has been conducted on the role of the family as a consumer socialisation agent over the past three decades (John, 1999; Carlson & Grossbart, 1994; Hempel, 1974). Hawkins et al. (2001) states that parents teach their children consumer skills both deliberately and casually through instrumental training, modelling and mediation. Instrumental training occurs, for example, when a parent tries to teach a child to eat a certain snack because it has nutritional value. Modelling occurs when a child learns appropriate (or inappropriate) consumption behaviours by observing others (for example parents who smoke). Mediation occurs when a parent alters a child's initial interpretation or response to a marketing stimulus (for example an advertisement depicting a situation in which a child will be rewarded with a snack for good behaviour). Special emphasis is placed on children's perceptions about the influence of promotional activities of television advertisements on their buying behaviour. The marketers design their marketing activities in such manner which attracts the consumers. Children in particular have an immature mind with respect to buying, which cannot have discretions about the nature of the material they are subjected to, through mass media advertisements. Majority of the said category instantly form an opinion about what they see, mostly in favour of it. This is a fast decision domain, where the exposures to mass media these youngsters enjoy, are on a high degree. The children are easy target to advertisers in such manner. The tendency of attracting towards the informations shown on TV or other media is common among children. Children are also easy to fall prey to their choicest advertisements being aired on media. Marketers see potential market in children. They treat children not only as primary market, but as influencers and the future market. They have very deliberately entered the schools. They put up posters and billboards in the schools, persuading the cash-starved schools into opening their doors to them by paying for access to classrooms and space for their advertising material and promotions. Webbased groups providing free e-mail accounts and contests with tempting prizes is another strategy that is rampantly used. This almost approximates to a crime because it is nothing less than attacking the natural credulity of the most innocent, most gullible and most inexperienced beings on earth. Every day crying of children like-Mom I want this, Dad I want this” are the demands, fuelled by marketing tactics that corrode the adult wallets. The marketers are relying on the children to pester the mom to buy the product, rather than going straight to the mom. Children rule, be they in terms of what to watch over TV or what to buy for themselves or what a household buys. The influence that the children wield over purchase decisions in a household along with the nagging effect that they have on their parents is growing day by day. With the increase in the number of working couples, their pester power is inversely proportionate to the time available with parents. Their day begins with Tom and Jerry and ends with Dexter. There is an untiring wish list of food, fun, collectibles, gadgets and brands. The influx of niche channels especially designed for children like the Cartoon Network, Hungama and Toonami has given a big push to the pester power in India. According to some estimates, in 2005, there were more than 120 million tween (children between 8-12 years of age). Among them around 45 million live in urban areas who have the power of determining or influencing the whopping Rs. 20,000 crore worth purchasing decisions on food, mobile phones, apparel, cars and FMCGs. This offers a big temptation to the marketers to treat the pre-adolescents as mature and independent customers and creating a peter power. Using this strategy, they have been successful in making parents almost redundant in purchase decision. The eating habits developed in childhood develops food preferences for the whole life if not completely then definitely some of the habits are carried forward in adulthood. Children market remains crucially important as the marketers seek to attract a new audience and build brand loyalty at a very young age. The advertisements have created very powerful and vocal kid consumers with huge buying leverage. In a compilation of studies done on children's media habits has deduced that children under eight are unable to critically comprehend televised advertising messages and are prone to accept advertiser messages as truthful, accurate and unbiased, leading to unhealthy eating habits. It is claimed that consumer preferences can be manipulated through advertising. Clearly advertising tends to affect knowledge, preferences and behaviour of its target market since that is the reason for doing it (Linvingstone, 2004). Advertising could influence eating habits for young children (Hastings & al., 2003). The logic behind any advertising is quite simple: it tries to “meet consumer needs and create new ones”. In 2007, the first-hand information acquired by consumers and then used as a shortcut in subsequent decision making – explanation added) by advertising a family friendly environment and generating positive associations that may attract consumers. Children have many sources though which they are gaining knowledge about food product. The TV, Internet, Newspaper, other mode of classical advertising are common source of informations. The concern of health with food products consumptions and its impact of children's health have always been seen as an issue. Zuppa, Morton and Mehta suggest that the amount of advertising to which children are exposed “has the potential to influence children's health attitudes and behaviours. Television may be more influential than families in setting children's food preferences” Epstein et al (1995) clarify the link by identifying a co-relation, but not causation between television viewing and obesity. There has been significant impact on the health of children due to over eating, consumption of unhealthy food. There has been concern over the harmful effects of food promotion to children. High levels of concern currently centre on the evidence of rising obesity among children, in common with many other countries in the developed world (World Health Organization, 2000). Previous food-related concerns have included nutrition, dental health, dieting and anorexia, and so forth. The royal college of physicians has reported that the obesity among the children is increasing (Kopelman, 2004 & Ambler, 2004). All agrees that the food industry is one of the major player in the field of advertising (Hastings et al 2003, Young, Paliwoda & Crawford, 2003). Studies show that food advertising on television is dominated by breakfast cereals, confectionary, savory snacks and soft drinks, with fast food restaurants taking up an increasing proportion of advertising on television. A major review of the field, recently conducted by Hastings et al (2003) for the food standards agency, has focused academic, policy and public attention on the role that food promotion, particularly television advertising, plays in influencing children's food choices, defined in terms of food knowledge, preferences and behavior. Both research methods and findings addressed in this and other reviews are much contested (Paliwoda & Crawford, 2004; Young, 2003; Ambler, 2004; and Livingstone, 2004) some reviews cover a wide terrain, examining the range of factors which may influence children's diet. Others are focusing on the direct effects of advertising on food choice. Unfortunately, much of the literature on diet and obesity pays little attention to media related factors such as exposure to television in general or advertising in particular. Also unfortunately, much of the literature on the effects of advertising pays little attention to the contextual factors which may mediate or provide alternative explanations for the observed relationship between media use and children's diet and/or weight. Reviewing the field is complex in part because the research available spans a range of academic disciplines, countries and contexts and also because empirical studies use different measures, control for different factors or omit valuable information. In reviewing the published literature, it is worth identifying not only what can be concluded but also what remains unclear as well as questions for future investigation. Importantly, the balance of evidence (experimental, correlation and observational) in the published literature shows that television advertising has a modest, direct effect on children's food choices. Although there remains much scope for debate, this conclusion is widely accepted across diverse positions and stakeholders (Livingstone, 2004). Food promotion is having an effect, particularly on children's preferences, purchase behavior and consumption. This effect is independent of other factors and operates at both a brand and category level' (Hastings et al, 2003). Lewis and Hill (1998) conducted a content analysis showing that food is the most advertised product category on children's television, and that confectionary, cereals and savoury snacks are the most advertised. Hence, 60% of food adverts to children are for convenience foods, 6% for fast food outlets, and the remainder for cereals and confectionery. Lewis and Hill (1998) in this study they found that overweight children are less satisfied with their appearance and have a greater preference for thinness; feeling fat was directly related to weight. In general, children feel better, less worried and more liked after seeing adverts. They also found an interaction effect: after seeing a food advertisement, overweight children feel healthier and show a decreased desire to eat sweets, while normal weight children feel less healthy and more like eating sweets than before seeing the ad. The opposite pattern was observed after viewing nonfood ads. Hastings et al (2003), 'the foods we should eat least are the most advertised, while the foods we should eat most are the least advertised'. A recent survey of UK parents conducted for the national family and parenting institute (2004) shows that parents feel their children are 'bombarded' by advertising to ever younger children and across an ever-greater range of media Platforms. They claim to be anxious, irritated and pressurized, not least because of the considerable domestic conflicts they claim that consumer demands from children result in within the family. Young (2003) in his study he concluded that children understand advertising from eight to nine years old and that they play an active role in families' food buying. Dietary preferences of children are said to be established by about five years old, before advertising is understood. The author further argues that a multiplicity of factors, of which advertising/television viewing is only one, influence eating patterns. Stratton & Bromley (1999) in their study they determined through a series of interviews that the dominant preoccupation of parents is to get their children to eat enough. Parents try to adjust the food to the preferences of family members so that children can eat. There was a notable lack of reference to nutrition and health when talking about food choices for children in the British families interviewed. There have been many investigations determinant of children's diets, while schools and peers are also influential in determining preferences and habits. A study in New Zealand, Hill, Casswell, Maskill, Jones & Wyllie (1998) showed that although teenagers had good knowledge of what was healthy and what not, what they ate was determined by how desirable foods were. This is really significant to develop the strong eating habits at the earlier stage of the life; if this pattern of eating habits would be continued in mature life and hard to change at a later stage of the life (Hill, Casswell, Maskill, Jones & Wyllie, 1998; Kelder, Perry & Klepp, 1994; Sweeting et al, 1994). Numerous studies pointed out the fact that those who eat with the family have healthier dietary habits. Family meals become less frequent as children get older and the frequency of those meals differ for different ethnic groups and socio-economic status (Neumark & Sztainer, Hannan, Story, Croll & Perry, 2003). The influence of family eating patterns on dietary intake stays strong even after controlling for other variables such as television viewing and physical activity. Eating away from home also increases the consumption of soft drinks which is related to problems with weight (French, Lin et al, 2003). The study confirms that it is a challenging task to research children. Marketers and researchers who wish to control the buying button "inside children's heads" should note that today's children are completely different from children of, say, ten years ago. Children are now technosavvy and more knowledgeable. They have increased access to information and have a greater knowledge and understanding of today's issues. They are truly the Internet generation, and get their news and information primarily from television. The recent trends have increase the interest of the marketers in child consumers. One of them is the discretionary income of children and their power to influence parent purchase. The other very significant development is the enormous increase in the number of available channels and thus created a growing media space just for children and children products. They understand the marketing and advertising campaigns presented to them. They are, however, rooted to home - their family is still their most important social group. The television advertisements open up many opportunities for parents to educate their children on matters relating to marketing and other consumer issues. This study stresses the need for future empirical research on children's consumer behaviour to be conducted in the Indian context. For example, the role of salespeople in the retail environment and the school as socialisation agents could fruitfully be studied. The literature study revealed that not a single study has been conducted to date in India to investigate the role of retailers in educating young consumers. The positive assistance given by the secondary school sector in this research should be utilised by marketing and consumer science researchers in order to add new insights to the existing body of knowledge in this vibrant field. Understanding how children become socialised to function as consumers is important not only from a managerial or marketing perspective, but also from a societal, technological and cultural perspective where issues such as single-parent families, drug abuse and the Internet require the attention of researchers. Future research could also focus on gender-role orientation and cross-cultural marketing aspects regarding the consumer socialisation which influences the food buying behaviour of children. Acuff, D. 1997. What kids buy and why: the psychology of marketing to kids. New York. Free Press. Ambler, T., Braeutigam, S., Stins, J., Rose, S. and Swithenby, S. (2004). Salience and choice: Neural correlates of shopping decisions. Psychology and Marketing, 21: 247–261. Blackwell, R, Miniard, P & Engel, J. 2001. Consumer Behaviour. 9th ed. New York. Harcourt. Cardwell-Gardner, T & Bennett, J.A. 1999. Television advertising to young children: an exploratory study. Proceedings of the 1999 IMM Marketing Educators Conference, September 1999. Carlson, L & Grossbart, S. 1994. Family communication patterns and marketplace motivations, attitudes, and behaviours of children and mothers. Journal of Consumer Affairs 28(1): 25-54. Carlson, L, Laczniak, R & Walsh, A. 2001. Socializing children about television: an intergenerational study. Journal of the Academy of Marketing Science 29(3): 276-288. French, S. A., Lin, B. H., and Guthrie, J. F. (2003). National trends in soft drink consumption among children and adolescents age 6 to 17 years: Prevalence, amounts, and sources, 1977/1978 to 1994/1888. Journal of the American Dietetic Association, 103(10), 1326- 1331. Gorn, G & Florsheim, R. 1985. The effects of commercials for adult products on children. Journal of Consumer Research (11),962-967. Hastings, Gerard, Martine Stead, Laura McDermott, Alasdair Forsyth, Anne Marie MacKintosh, Mike Rayner, Christine Godfrey, Martin Caraher and Kathryn Angus. (2003a). Review of research on the effects of food promotion to children. Final report, prepared for the Food Standards Agency, 22nd September, 2003. Hawkins, D, Best, R & Coney, K. 2001. Consumer Behaviour. Building Marketing Strategy. 8th ed. Boston. McGraw-Hill. lHempel, D. 1974. Family buying decisions: a crosscultural perspective. Journal of Marketing Research 10:295-302. Hill, L., Casswell, S., Maskill, C., Jones, S., & Wyllie, A. (1998). Fruit and vegetables as adolescent food choices.Health Promotion International, 13(4), 55-65. John, D.R. 1999. Consumer socialization of children: a retrospective look at 25 years of research. Journal of Consumer Research 26(3): 183-237. Kelder S. H, C L Perry, K I Klepp and L L Lytle. (1994). Longitudinal tracking of adolescent smoking, physical activity, and food choice behaviors. American Journal of Public Health, 84(7), 1121-1126. Kopelman. (2004). cited in Ambler, T. (2004). Does the UK promotion of food and drink to children contribute to their obesity? (Centre for marketing working paper No. 04- 901). London: London Business School. Lewis, M. K., and Hill, A. J. (1998). Food advertising on British children's television: A content analysis and experimental study with nine-year olds. International Journal of Obesity, 22(3), 206-214. Livingstone, Sonia (2004). Advertising Foods to Children: Understanding Promotion In The Context Of Children's Daily Lives [online]. London: LSE Research Online.http://www.lse.ac.uk/collections/media@lse / Dated: 12-11-2013. Macklin, C. 1987. Preschoolers' understanding of the informational function of television advertising. Journal of Consumer Research 14: 229-239. Mc Gregor, S. 1999. Socializing consumers in a global marketplace. Journal of Consumer Studies and Home Economics 23(1): 37-45. Mc Neal, JU & Yeh, C. 1993. A cross-cultural study of children's consumer socialization in Hong Kong, New Zealand, Taiwan, and the United Nations. Asia Pacific Journal of Marketing and Logistics 5(3): 56-69. McNeal, JU. 1973. An Introduction to Consumer Behaviour. New York. Wiley. Mc Neal, JU. 1993. Born to shop. Children's shopping patterns. American Demographics 15(6): 34-39. Mc Neal, JU.& JI, M. 1999. Chinese children as consumers: an analysis of their product information sources. Journal of Consumer Marketing 16(4): 345-364. Meyer, T. 1987. How black children see TV commercials. Journal of Advertising Research 18:51-85. Mishra.H.G,& Singh.S. (2012) Due to Television Commercial, Change in Eating Habits and its Direct Impact on Obesity of Teenager of Jammu;The Public Administration and Social Policies Review IV Year, No. 1(8). Neumark-Sztainer, D., Hannan, P. J., Story, M., Croll, J., and Perry, C. (2003). Family meal patterns: Associations with sociodemogpaphic characteristics and improved dietary intake among adolescents. Journal of the American Dietetic Association, 103(3), 317-322. Norum, P & Scrogin, J. 1996. Consumer complaint behaviourin the children's wear market in the US. Journal of Consumer Studies and Home Economics 20:363-375. Paliwoda, Stan and Ian Crawford. (2003). An Analysis of the Hastings Review: The Effects of Food Promotion on Children. Report prepared for the Food Advertising Unit, December (2003). Roedder, D. 1981. Age differences in children's responses to television advertising. Journal of Marketing Research (8),144-153. Sheth, J, Mittal, B & Newman, B. 1999. Customer behavior: consumer behavior and beyond. New York. Dryden Press. Soni.S & Upadhyaya.M(2007). Pester Power Effect of Advertising; International Marketing Conference on Marketing & Society, 8-10 April, 2007, IIMK 441. Stratton, P., & Bromley, K. (1999). Families Accounts of the Causal Processes in Food Choice. Appetite. 33(2),89-108. Sweeting, H., Anderson, A., and West, P. (1994). Sociodemographic Correlates of Dietary Habits in Mid to Late Adolescence. European Journal of Clinical Nutrition, 48(10), 736-748. Ward, S. 1974. Consumer socialization. Journal of Consumer Research 1 (September): 1-14. Yavas, U & Abdul-Gader, A. 1993. Impact of TV commercials on Saudi children's purchase behaviour. Marketing Intelligence and Planning 11(2),37-43. Young, Brian (2003) Advertising and Food Choice in Children: A Review of the Literature. Report prepared for the Food Advertising Unit, August (2003).